Not sure if Julia knew just how big this book would become. I would dear say, that this book is the “Very Hungry Caterpillar” of this current generation. A book about a mouse who encounters many other animals that would eat him. 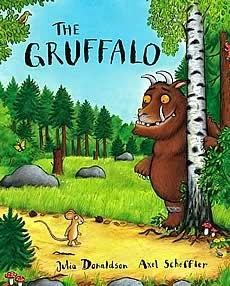 Using his mind, he fibs about having a meal with the Gruffalo of the forest. They all flee from the mouse where they hear how terrible this Gruffalo is, but then... The Gruffalo appears. A very good twist on a chinese fable about how a mouse tricks a tiger into believe that he is the most feared in all the land.